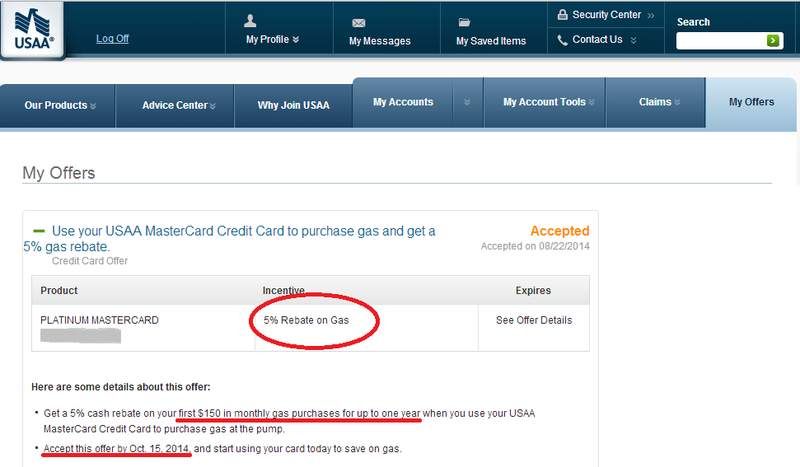 Discounts & Deals 4 Military: USAA - 5% back on Gas for 1 YEAR!! USAA - 5% back on Gas for 1 YEAR!! USAA periodically puts on special offers on its credit cards. Sometimes these offers are lame whereas other times they are amazing. Last year I was getting 8% back on gas because I combined two of their offers. My Platinum MasterCard has a promotion going on right now where you can get 5% back on gas for one whole year. This is a 'targeted offer' so your credit card may not have it but its worth a try. You can accept this offer by logging into USAA and clicking on the "My Offers" tab. You can also access the offers from your mobile device by going to My Accounts, then clicking on one of your credit cards, and then clicking on the green writing that says "You have special offers"